The agency had called Mr Karti Chidambaram for questioning today in connection with the foreign investment clearance given in 2006 in the Aircel Maxis deal when his father P Chidambaram was the Finance Minister. 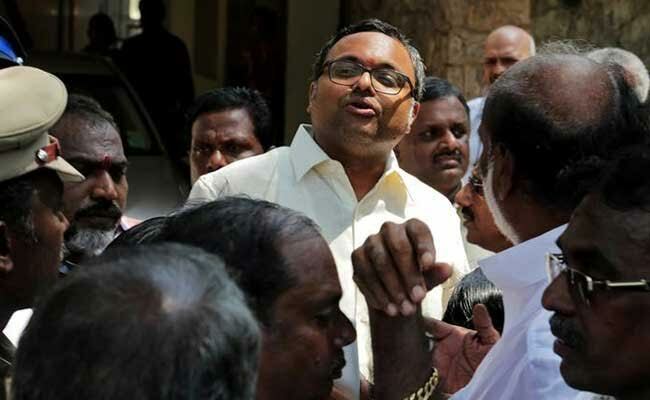 New Delhi: Karti Chidambaram today refused to appear before the Central Bureau of Intelligence (CBI) in the Aircel Maxis case saying a special court had discharged all the accused and terminated proceedings in the matter, a claim strongly contradicted by the CBI which said that the investigation was still on. Mr Karti Chidambaram, through his lawyer, has refused to appear before the agency saying a special court had discharged "all the accused" in the matter. "All proceedings connected with the said (case)... were also terminated," the response said. "The response has been received by the CBI today at 10.30 am through a courier service. The response has also been sent through fax and email," Mr Chidambaram's lawyer Arun Natarajan told PTI on phone. The response said after the discharge of the accused and "termination" of the proceedings, the CBI will not have jurisdiction to issue a summons in connection with the case. The CBI strongly contradicted claims of Mr Karti Chidambaram saying only four, including two companies, of the eight charge sheeted accused were discharged by the special court and the agency has already filed an appeal against the order in the Delhi High Court in May this year. "FIR RC-22(A)/2011-DLI has not been quashed by the court and further investigation under 173(8) of the CrPC is continuing," CBI Spokesperson Abhishek Dayal said here today. He said two Malaysian nationals and two Malaysian companies who were charge sheeted by the CBI in the matter did not appear before the special court and warrants were issued against the individuals. "Court proceedings are still pending. Request has been placed before the Interpol for issuance of Red Notices against the two Malaysian nationals," Mr Dayal said. The CBI sources said all the options are open before them in the matter. They said that examination also gives suspects a chance to put forth their case before the agency. The investigation into alleged irregularities in granting foreign investment approval to Global Communication Services Holdings Ltd for investment in Aircel is still going on, the CBI sources said. They said the agency is also looking into investments made by firms controlled by Karti Chidambaram into Aircel while the Former Investment Promotion Board (FIPB) clearance issue was under the consideration of the Finance Ministry. In August 2014, the CBI had charge sheeted former Telecom minister Dayanidhi Maran, his brother Kalanithi, Malaysian business tycoon T Ananda Krishnan, Malaysian national Ralph Marshall and four firms- Sun Direct TV Pvt Ltd, South Asia Entertainment Holding Ltd, Maxis Communication Berhad and ASTRO All Asia Network PLC. In an order on February 2 this year, the special CBI court had discharged Dayanidhi Maran, his brother Kalanithi, Sun Direct TV Pvt Ltd and South Asia Entertainment Holding Ltd saying the charges were without any "legal basis". The court order, however, did not have any effect on the two accused Malaysian nationals--Ralph Marshall and T Ananda Krishnan--in the CBI's case as the court has already segregated the proceedings against them from that of Maran brothers and others. Both had not appeared before the court. The CBI had challenged the order of discharge in the Delhi High Court on May 11 this year.